3B's Toy Hive: Killer B Contest: Christmas Comes Early! Are you a fan of Mattel's WWE toys? Do you like winning free stuff? 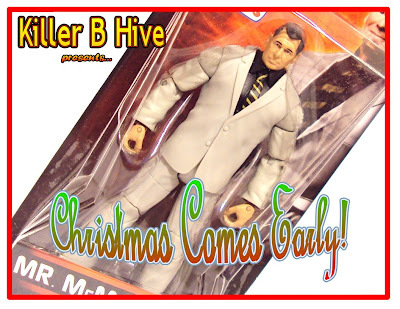 Then enter for your chance to win a Mattel WWE prize package courtesy of the Hive in our "Christmas Comes Early" giveaway! To enter all you have to do is become a fan of KBH on Facebook and comment under any of the Christmas Comes Early CONTEST posts with the phrase "I love WWE!" and you're entered! What does the prize package include? Swarm to find out! - Please make sure to read the complete rules before entering! - You do not have to celebrate Christmas to participate, but you must actually love the WWE! - The contest is open to all Facebook users following "Killer B Hive". - Limit one entry per valid Facebook account. - One grand prize winner will be selected randomly from all entries. - Please DO NOT comment on the post after entering, or you will be DISQUALIFIED. Yes. Really. - I'm paying for shipping costs, so that means the prizes will only ship to the USA (I'm cheap!) via Priority Mail. Global fans are welcome to join, but I'm only shipping to the US, so I hope you know someone here that will handle the package for you. Sorry, no exceptions. - I'm not responsible for lost or stolen mail. Make sure someone's home when the package is delivered! - If you're not allowed to participate in prize giveaways, don't. - The winner will be notified via their FB account. Please reply within a reasonable amount of time (48hrs) or another winner will be selected. - If you're planning to sell these prizes, you're a douchebag and I hope you don't win. - Contest may be canceled at any time, for any reason (just in case some rabid WWE fan breaks into the Hive and plunders the loot!). - This contest is FREE! Do not send money to me or anyone claiming to be me for any reason whatsoever! - Read that last one again. - Also, you must post a picture of yourself with the prizes on the FB page! Just kidding, enjoy!